A Paper Delivered to the AMMLA (European Masonic Museums & Libraries) Conference, Bayreuth Germany, July 2009. ‘It is difficult to define (ephemera) except by saying that it is everything which would normally go into a wastepaper basket after use, everything printed which is not actually a book’. The derivation of the word is from the Greek ephemeros, which translates as lasting only a day. In modern Greek the word for a newspaper is ephemeris. The emphasis in this paper is mostly on the first of these headings. They are all a valuable and important reflection of contemporary views and tastes as well as activities. They often give an insight into aspects of our society not to be found elsewhere. Among the earliest printed evidence of the antagonism towards our fraternity is a single small leaflet, 100mm by 165mm, of which only one copy is extant. This leaflet is a good example of the importance of an ephemeral item to the study of the development of Freemasonry in its early days. 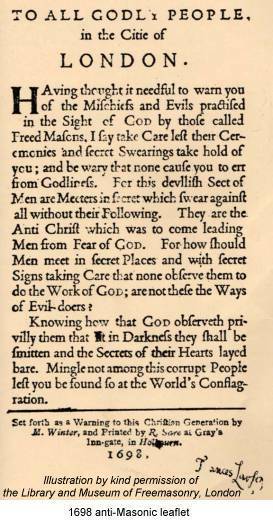 The leaflet is headed To All Godly People, in the Citie of London and dated 1698, nearly two decades before the formation of the premier Grand Lodge. It is set in the Roman typeface popular during the period and prior to the much more pleasant typeface invented by William Caslon some two decades later. GOD; are not these the Ways/ of Evil-doers? Very little is known about the circumstances under which the pamphlet was issued. In the leaflet, Freemasonry is condemned for the anti-religious standing of its membership. Bro Knoop and G P Jones in their article in AQC 55 (1942) titled ‘An Anti‑Masonic leaflet of 1698’ give a prime example of how much consequential information can be obtained from the content of this apparently simple ephemeral item. They speculated and concluded that Winter, the author, about whom no information is available, was pious, probably a chiliast, condemning Masons as crypto-Romanists; and that these denunciations in the leaflet in 1698 may have been based on fact, although there was no reason for the Masons to be accused of popery. The content of the leaflet confirms that Freemasonry was considered an evil institution because of its secret signs and meeting places. The most interesting conclusion reached by Knoop and Jones is that the statement that the Masons were antichrist implies that they were anti-Trinitarian. Therefore Freemasonry may well have adopted a deistic attitude towards religion long before Anderson’s constitutions of 1723. The only known extant copy of the leaflet was discovered by Bro Albert Frost of Sheffield and donated by him to the Grand Lodge Library in 1943. This leaflet, as would be the case for similar broadsheets of this period, would have been printed in small quantities, printing costs being minimal at the time. It would have been handed out to passers-by by street hawkers and ‘mercury women’, whose function was to sell and hand out both official government announcements as well as unofficial notices, news sheets and other leaflets. As early as the 1690s hawkers were distributing newspapers in the streets of London. The famous London Gazette, which first appeared as The Oxford Gazette in 1665, was then published twice a week. In between publishing days, the official vendors of the newspaper filled their time by selling or distributing all sorts of other printed material. Copies of the printed sheet, handed out on street corners, would also be pinned on the walls of clubs, work places and coffee houses and left on tables, to be picked up by customers. They were soon discarded and lost forever just days or weeks after publication. The 1698 leaflet described stands out as an exceptional rarity. There are no other early leaflets which have survived, which so blatantly attack Freemasonry. We have to look at exposures, also printed as one or two sided broadsheets, to appreciate the continued antagonism towards our fraternity. The Grand Lodge Library houses the rich collection of ephemera which originally belonged to that extraordinary Masonic collector Alexander Mayrick Broadley (1847-1916). He was initiated in Bridport in 1869. A registered barrister, he spent much of his Masonic life in Tunis and Malta. Active in most of the orders beyond the craft, Broadley was appointed Deputy District Grand Master for Malta in April 1879 and Provincial Grand Master for the Mark Province of Tunis and Malta in September 1879. He wrote extensively and compiled a truly superlative Masonic collection of printed items. In 1917 Wallace Heaton purchased Broadley’s collection at a sale where no other dealers appear to have been present. The whole of the Heaton collection was subsequently purchased from him and donated to the United Grand Lodge of England in 1939. It is housed in a total of nine volumes. One section is devoted to Anderson’s late Constitutions which are interspersed with various prints and portraits. The next three volumes are almost purely ephemera. It contains, among a multitude of ephemeral treasures, a unique single sheet 190mm x 300mm in size, attacking Freemasonry by exposing its supposed secrets. It is the earliest known Irish exposure dated 1725 and entitled The Whole Institutions of Free-Masons Opened. It is printed on both sides. It was published by William Wilmot who has been identified as a Dublin printer and who flourished between 1724 and 1727. The importance of this single sheet document, inter alia, is the disclosure of the early use of words and signs for the third degree - without evidence, however, that three separate ceremonies were in practice. The document also mentions, for the first time in print, the word Jehovah. Again, however, without detail of any ritual working related to the word. It gives us a minute insight into anti-Masonry during the periods concerned. Had more leaflets survived we may have learnt more of such attitudes. A total of nine manuscripts dated between 1696 and 1750 are listed and discussed by Knoop, Jones, and Hamer in their The Early Masonic Catechisms, published by Quatuor Coronati Lodge in 1975. The greater significance of printed versions, however, lies in the intent of publishers to reach a much wider circulation of the broadsheet. Our own Grand Lodge minutes allow us a view of the mode of distribution of such leaflets. The minutes for the 28 August 1730 Quarterly Communication refer to Dr Desaguliers’ concern over ‘a printed paper lately published and dispersed about Town’. The reference is to the very rare ‘Mystery of Free-Masonry’. William James Hughan, the renown Masonic scholar, reported in 1909 that there were then only two known examples of the original broadsheet still in existence. One was purchased by General Lawrence of Boston USA from Spencer & Co who offered it for sale in their 1875 Book Catalogue. A second copy was in the private library of T Francis of Havant. This ephemera sheet would have been distributed in coffee shops, taverns and sold in pamphlet-shops in the centre of the city. Consequent to the printing of the leaflet a series of letters appeared in The Daily Journal starting with the edition of Saturday 15 August, in which a letter referring to the activities of the fraternity and signed ‘F.G.’ concludes with a full version of the exposure. There is, incidentally, a second letter by ‘F.G.’ (not ‘C.G.’, as quoted in some sources) requesting a re-print of his letter and exposure which appeared with identical text in the next issue No 2999 on Tuesday August 18. This was followed by a letter by a reader with the initials ‘J.B.’, published on Saturday August 22 (No 3004) quoting in detail the obligation taken by the candidate. An error in the numeration of the paper repeats No 2999 for two consecutive issues, omitting No 3000 from the sequence. The extent of the interest in these exposures is reflected in the widespread re-publication of the letter and attachment. In addition to several newspapers in England, the letter and exposure were also published in full in the 8 December 1730 edition of Benjamin Franklin’s own Philadelphia Gazette. It may be worth noting that Dr Franklin had not yet joined the fraternity at the time. This widespread circulation and apparent popularity of the catechisms disclosing Masonic ritual may not necessarily have been induced by the curiosity of the general public. There is the distinct possibility that these leaflets, just as Prichard’s well documented Masonry Dissected and other exposures, may have been popularised by Freemasons themselves purchasing the literature in order to use them as aidés-memoir. It may even be suggested that the repeated publication of Masonry Dissected in umpteen editions (as well as Richard Carlisle’s various Manuals published after the union) were intended specifically for Freemasons as the potential customers. Market Days, by his Lordship’s Deputy, the Cryer. The anti-Masonic text of the proclamation itself, within the content of the whole defensive letter, has been reproduced in Notes and Queries in AQC 33 (1920) on page 186. The interest, for purposes of this paper, lies in the fact that there appear to be no surviving copies of the proclamation itself. The economic aspects of setting and printing such leaflets suggests just a small number being produced. This explains, to some extent, their rarity. We still cannot escape the intriguing possibility, however, that hidden somewhere, most likely in collections totally unrelated to Freemasonry, lie more of these priceless fascinating documents, waiting to be discovered. Douglas Knoop, G P Jones and Douglas Hamer in their ‘Early Masonic Pamphlets’ published by QC in 1978 listed and carefully analysed pamphlets and booklets which include criticism of Freemasonry and exposures of the ritual. These publications were meant to be permanent. It is the single page broadsheets, printed and intended to be discarded, that are ephemeral and not included in the above listing. The various forms of what we have come to call printed media have two factors in common: the conveyance of news and their ephemeral nature. The Roman Acta Diurna, established by Julius Caesar in 60 BC, is the earliest record we have of a ‘newspaper’. The act established the issue of a regular bulletin made available in the Forum and discarded on a daily basis, being replaced by a new updated version. In the Middle Ages, town criers fulfilled the function of newsmen and in the 16th century handbills, pamphlets and broadsheets were used to communicate news. At the same time ballads and often insidious or controversial leaflets were also distributed. As already mentioned, these, the true predecessors of the modern newspaper, were often sold at fairs and in shops. They were also distributed in coffee houses, pamphlet-shops and in the streets by ‘hawkers’. another....by the Names of, Betty, Nelly, and so forth. It should be noted that these ‘letters’ are often essays written by, and expressing the views of, the publisher. Two further mentions of Freemasonry appeared in issues 73 and 166 of The Tatler, 24-27 September 1709 and 29 April-2 May 1710 respectively. Sir Richard Steele (1672-1729), the publisher of The Tatler was Dublin born dramatist and politician, knighted in 1717. His named portrait is centrally placed on the engraved Lists of Lodges in the print entitled Les Free-Masons published in the 1735 edition of Bernard Picart’s Cérémonies et costumes religieuses de tous les peuple du monde. There is no explanation as to why Sir Richard Steele appears on the print, especially as there is no evidence of his ever having become a Freemason. The only viable reasoning is that in 1735 Steele was already dead and the use of portraits of dead personalities was exceedingly cheap where living dignitaries demanded high, even exorbitant, fees to have themselves represented on prints of this kind. Not long after this the Premier Grand Lodge was formed, in June 1717 the use of the press for announcements became increasingly frequent, including details of the admission of personalities into the Society of Free-Masons. Anderson’s ‘minutes’ published in the 1738 edition of the Constitutions record on page 114 the irregular election that took place in June 1722. There is little doubt that Anderson used these same news reports as his source of reference for the events that took place in the decades preceding the publication of the second Constitutions. Hints of antagonism towards the craft which appeared in the press gradually turned into blatant attacks. The first printed exposure of Masonic ritual appeared in No 4712 of The Flying Post or Post Master on April 11-13 1723, within weeks of the publication of Anderson’s Constitutions. The exposure was attached to an anonymous letter addressed To the Author of the Flying Post and is now referred to as A Mason’s Examination. It gives us the earliest insight into Masonic ritual practised at the time. At this stage I need to recount a personal and fortunate experience regarding early newspapers. In November 1999 I purchased a copy of The Post Boy, number 5373 dated Thursday December 26 to Saturday December 28 1723 from a dealer in the Channel Islands. Halfway through the second column and ending nearly at the end of the next, on the reverse of the newspaper was a letter, obviously Masonic in content, addressed to the Author of the Post Boy signed Yours &c A.B. The catechism was clearly intended to look like an exposure of Masonic ritual to a non-Mason. (We can define an exposure as a spurious and unauthorised disclosure of Masonic ritual). The author of the letter in my copy of the Post Boy actually referred to the earlier issue of The Flying Post in April of the same year, referred to above. I remember, when I was last in Town, there was a Specimen of their (the freemasons’) Examination published in the Post Boy; but so industrious were the Masons to suppress it that in a Week’s time not one of the Papers was to be found; where-ever they saw ‘em they made away with them. The author continues at length on the methods used by the masons to do away with all available copies of the newspaper. He states I cannot charge my Mind with the Date of the Paper and urges his son to obtain a copy by any Means. He continues, stating that the masons were angered by the publication although they pretended not to give it any importance and that they ‘presently put out a sham Discovery to invalidate the other’. He ends this part of his letter by stating that: ‘a friend and Mason let me understand that this was a genuine Discovery.’ The thought that the Masons had actually succeeded in obtaining and destroying all available copies of the newspaper was astounding. Yet, it looked as that was exactly what may have happened. Masonic scholars to date have searched and have been unable to trace a copy of the issue of The Post Boy referred to in The Free-Masons Accusation and Defence. There have been an abundance of published theories, including those by Knoop, Jones & Hamer in their Early Masonic Pamphlets, as to what the author may have been referring to. All end by effectively presuming that the allusion to the existence of an additional exposure was fictitious. Not so! Q. Are you one of us? Q. How will you be try’d? Another example is found in the thirty-fourth and thirty-fifth questions, which show the sort of subtle revisions to what was generally accepted as Mason’s secrets. Q. What is the Apprentice’s Word? Q. What is the Fellow Craft’s Word? All of the early catechisms are in agreement that the Masons had two secret words from the Bible: Boaz and Jachin. The Post Boy gives biblical B and J words, just different ones from the rest of the catechisms. The Post Boy catechism is almost certainly a ‘sham’, a misleading publication, appearing as a disclosure, intended to lead readers at the time away from the real secrets of the Craft. The first record of any masonic journal is Der Freimaurer, published in Leipzig, Germany in 1738. There appears to have been no other Masonic newspapers or journals in the British Isles until the publication of The Sentimental and Masonic Magazine, in Dublin from July 1792 to August 1795. Masonic ‘newspapers’, in the sense of daily information provided for Masons, was an unknown concept. The weekly and monthly Masonic periodicals, with just two exceptions, were only popularised in the 19th century. The subject of Papal Bulls, which remains the greatest manifestation of the controversial concept of Papal infallibility, has been extensively covered in Masonic literature including the pages of our transactions. They are the most overt display of the Church’s hostility to Freemasonry. Here, I would like to consider the ephemeral aspects of Papal Bulls, copies of which were nailed or otherwise fastened to church doors across Europe during the course of the eighteenth century. 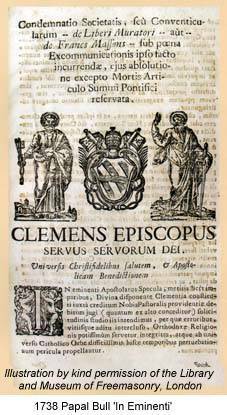 This was the method of communicating officially and with authority the word of the Holy See to the faithful across the nations. The Papal Bull was at the top of the list in order of importance of communications emanating from the Vatican. Lesser matters were communicated by briefs, regulations and edicts, inter alia. The Bull was initially hand-written in Latin on vellum parchment in elaborate calligraphy using convoluted terminology. The folding and formal sealing of the document involved a painstaking ceremony at the end of which the Papal seal was applied to a metal ingot, the Bullæ. The Papal Bull was then authenticated. which translates as: Published on the doors of St Peter’s and other usual places. and usual places by me, Franciscus Bartolotti, Apost. Pursuivant. The importance and power of the Papal Bulls are underlined by the fact that they were considered worthy of forgery, examples of which are exceedingly rare. The genuine, printed Papal Bulls were effectively circulated as bill-posters to be discarded in due course, which explains their rarity. We are less concerned today with the type of Masonic education that was so important to the Brethren of the eighteenth and nineteenth centuries. Preston, Brown, Finch, Hutchinson and Claret, among others, saw the importance of education as their primary concern with Masonic development. Notwithstanding personalities, financial gain and conflicts of interest, these were teachers in the true sense of the word. They identified themselves as such and without impropriety advertised themselves whilst soliciting ‘business’. The solicitation came by way of publicity leaflets and pamphlets, often tacitly supported by Grand Lodge. These ephemeral price-lists ‘selling’ Masonic degrees and offering other facilities often give us an insight unavailable from other sources. They divulge the business acumen of Preston; they remind us of the troubles of Finch which led to his offers of a range of degrees in manuscript. Such blatant commercialisation is difficult to imagine today. 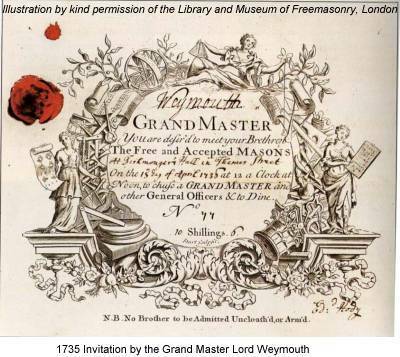 William Preston, best known for his Illustrations of Masonry and his influence on our modern ritual, was the first to publish prospecti for Masonic courses and leaflets promoting and advertising his activities. His 1774 ‘Book of Courses’ was advertised by way of a small leaflet headed FREE-MASONRY. It was intended for distribution to Brethren through the various Lodges. The quasi-official standing Preston enjoyed as a scholar is reflected in the Quarterly Communication of Grand Lodge of February 1775 where his Lectures are publicised as being held every Tuesday at the Mitre Tavern in Fleet Street. The remainder of the text effectively consists of an apologia: that the expense is ‘trifling’ and that such low costs show that ‘interest is not his object’; that the subscription paid will be returned to any subscriber who is not ‘Master of either the first or second degree’ within twelve lessons. The use of the word ‘Master’ in association with first and second degrees has caused comment. The terms were not in use as ordinary Masonic nomenclature. Could Preston’s salesmanship extend to implied deception? May his wording ‘Master of the first...degree’ be deliberate, intended to encourage new initiates still inexperienced in the language of the craft? Bro Colin Dyer in his extensive and standard book William Preston and His Work, gives us minute details of the man’s character and achievements. There is no evidence to indicate whether Preston’s lectures were a success or not. The part that the advertising leaflets played in his career, however, is self evident. From the early 1700s fraternal organisations, including the Freemasons, attended and supported the arts. In 1723 The Theatre Royal in Drury Lane staged Love In A Forest with a dedication by the author, Charles Johnson, himself a Freemason, to the Worshipful Society of Freemasons. This has been described in detail in Fred Pick’s article ‘Freemasonry and the Stage’ published in the Manchester Lodge of Research, Transactions No. 29 in 1939. In 1728 we have the first of several instances of the direct involvement of Grand Lodge in support of the theatre. Lord Kingston, at the Quarterly Communication on 27 December of that year, following his installation as Grand Master, announced his intention to attend the Old Play House, hoping and expecting Brethren to accompany him. In August 1730 a Masonic play proper, The Generous Freemason was staged in London, billed as a musical curiosity and a tragi-comi-farcical opera. It cannot be easy for us, on the threshold of the 21st century, readily to identify with the overall ambience of Freemasonry in the 1700s. Our charitable aims are manifest in our activities. A combination of posters, newspaper advertisements and announcements combine to provide us visually with information not found in contemporary literature. Attitudes towards the craft changed during the last decades of the 18th century and the change is reflected in plays and reports of the period. 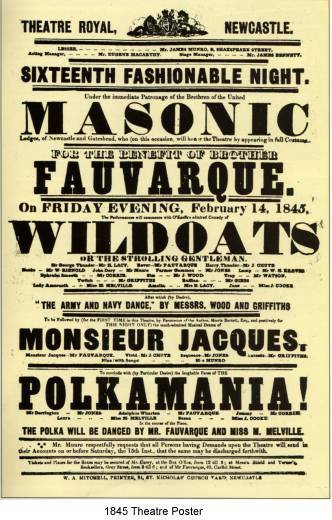 The one page leaflet, 240mm x 160mm, was distributed by the Theatre Royal, Covent Garden, advertising a performance of The Man of the World to which is added the Masonic pantomime: Harlequin Free-Mason. The text proudly announces that this is to be the fifty first time that the Harlequin Free-Mason is being performed. Several of these early leaflets are extant and all are printed in Roman type. They are crowded with text and detail. Only the size of the type-face differs. The words Harlequin Free-Mason are in the largest type, centrally placed to emphasise the Masonic aspect of the performance. The printer has attempted to achieve an artistic effect on the very simple black and white posters by a wide separation of words and letters, particularly in the listing of the named actors. Letterpress in the 1780s was still very limited in its application. The advent of display typeface was not to become popular until a few years later. This early period, in modern printing terms, needed facilities that were cheap and print that was easy to produce. The speed with which some posters were printed is reflected in the misplaced overlay of one colour over the other, or the frequent misspelling of words or names. The temporary and ephemeral nature of these sheets of printed paper is reflected in the lack of attention or importance given to the printing processes. They were to be discarded and could hardly be considered works of art, so that care or pride in production was minimal. If there was a decorative element it was frequently a design from the existing stock of the printer. Only occasionally were new emblems, such as Masonic ones, produced for an event. A curious manifestation of this use of decorative cartouches from existing stock is the appearance of Masonic emblems on otherwise non-Masonic posters and other printed items; an indiscriminate choice by the printer, who, in finding no suitable devices in his stock associated with the subject of the poster or card, uses existing designs, which happen to be Masonic, to decorate the printed item, irrespective of its content. To consider briefly the subject of Instruction, as the second category of Ephemera, we can look at summonses, invitations and tickets. A summons is formally defined as an authoritative call to attend or do something. The success of the Premier Grand Lodge as a governing body may well be attributable, to some extent at least, to the adoption of the concept of being ‘summoned’ - that special peremptory demand for one’s presence at a meeting or assembly, emanating from a higher authority. The concept is imbedded in antiquity. It was respected and practised by the many trades guilds of medieval times. The Cooke manuscript, reliably dated 1420 or before, states, under the heading ‘Assembly’, starting with line 902, that ‘...the Master and the Fellows before warned be come to such Congregation...’. These early rules and regulations for operative Masons, which we refer to as ancient charges and of which the Cooke manuscript is amongst the earliest, are the ones that appear on the opening pages of our present Book of Constitutions. Elias Ashmole, the first recorded initiate in England, on 16 October 1646, has a second entry in his diary for 10 March 1682 which reads: I recd: a Summons to appr: at a Lodge to be held the next day. at Masons Hall, London. The concept is again referred to by James Anderson in his first Constitutions of 1723. Item III of The Charges of a Free-Mason is headed ‘Of Lodges’ and states that ‘...In ancient Times, no Master or Fellow could be absent from it (the Lodge), especially when warn’d to appear at it, without incurring a severe Censure...’. The summons seems to have played a central part in the daily activities of every Mason from time immemorial. In Anderson’s second Constitutions of 1738 on page 109 of Part III of his History of Masonry in Britain..., he states that the Lodges in London, having found themselves neglected, decided to join forces. Four of them accordingly met and formed themselves into a Grand Lodge on St John the Baptist’s Day in 1717. The Assembly and Feast was held on that day and before Dinner the oldest Master Mason Mr Anthony Sayer, Gentleman, was elected Grand Master who ‘commanded the Masters and Wardens of Lodges to meet the Grand Officers every Quarter in Communication at the place that he should appoint in his summons sent by the Tyler’. This is the first mention we have of a summons in its present context. All the Festival tickets were numbered, this one being No 124. The numerals are always in manuscript. The standard fee of 10 shillings and sixpence or half a guinea is also printed on the ticket and remained a set and constant fee well into the 19th century. The standard statement NB. No Brother to be admitted unclothed or armed, printed outside the highly decorative frame, also appears on all the tickets up to the end of the century. The copper-plate engraver’s name is on the invitation as: Sturt sculp. He chose a wide range of Masonic emblems to build a decorative frame around the wording. Among the trowels, compasses and squares is also an armillary sphere, significant in the early representations of symbols important to the fraternity. Similarly numbered invitation tickets for each year have the Stewards referred to by their lay titles. It is only in 1795 that we have an invitation giving the title Brother to the Stewards. The heading on this ticket is now His Royal Highness the Prince of Wales Grand Master. There is only a single bright red wax seal, that of the Premier Grand Lodge. The standard fee of 10 guineas applies as does the statement that no brother is to be admitted unclothed or armed. This, however, is augmented by the stark bold words at the bottom of the summons: No French Wines. This can be seen as a rare patriotic and political statement, expressing prevalent sentiments following the declaration of war on Britain by the French Republic in February 1793. The text is enclosed by a delicately decorative frame headed by the Prince of Wales’ feathers. Using also one example for the third category of ephemera, namely advertising, we can look William Cole, namesake and successor to Benjamin Cole as printer to Grand Lodge. He appears to have taken sufficient pride in his own achievements to justify advertising himself by placing his name prominently on printed summonses as the engraver and printer of the list of Masons' lodges giving his address at No. 109 Newgate Street, London. He also used his skill for his own benefit by producing the most attractive trade card to publicise his activities. William Cole distributed to his potential clients an engraved sheet worthy of recognition as a work of art in its own right. The elaborate calligraphic text, in italic and various type styles, is framed off centre on the 175mm x 215mm trade card. The background can be moderately described as magnificent. It embodies heraldic devices, banners, globes, young cherubs clothed in 18th century attire at work in the various trades described on the trade card, emblems and other general decor, showing an engraver at his very best. Only a modest representation of the square, compasses and the level give a hint of a Masonic association. While we may learn much about William Cole through his trade card, it is still the exquisite design of the background engraving that is most charming and of most significance. Freemasons were often associated closely with the nobility and gentry of the period. The use of copper-plate engravings by members of the fraternity reflected an element of the elegance and prestige of contemporary society. The square and compasses, plumb rule, globes and maul are objects which appear repeatedly on a range of trade cards which are otherwise unconnected with Freemasonry. A further example of early advertising ephemera is to be found in the widespread identification of Freemasonry as a popular social activity. This led many manufacturers to create products aimed at the fraternity. Music sheets, beer, wine, tobacco and even match box labels appeared with Masonic brand names on them. Prior to 1800 the quality of the printing on cigar labels, for instance, could not match the beauty and colour of the later chromo-lithography. Smoking and drinking, however, were popular activities and tobacco manufacturers and vintners capitalised on their popularity. 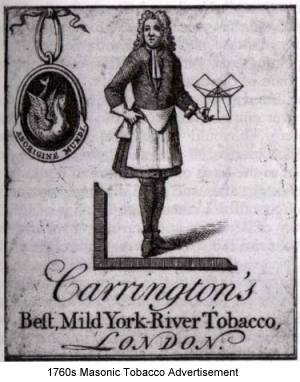 The earliest example we have of the commercialisation of a Masonic brand is to be found in the tobacco trade. As ships sailed from Scotland and England to America to return with Virginia tobacco, manufacturers printed a range of packaging designs. A number of quaint small sized labels about 55mm x 65mm all show Masons in their aprons. Stainer’s Best Virginia has an engraved depiction, no doubt inspired by Benjamin Cole’s frontispieces to the List of Lodges. An architect, the square in his left hand, is pointing with his right to the plans for the building whilst two Masons in their aprons observe and listen. Masonic tools are dispersed in the foreground and buildings in the background. The tobacco brand is inscribed on a rolled sheet supported by a pipe. Cigar smoking was seen as an expensive and luxurious activity and later packaging reflected the fact with high quality, often gold embossed, printing, even though many of the most fanciful and expensive looking labels belonged to the lowest quality cigars. Ephemera, early ephemera in particular, gives us insights not available from other sources and as collectors of guardians of artefacts, we will often find that the greatest satisfaction in collecting is to be derived, not from the object itself, but from the knowledge that we have been able to gain through it.